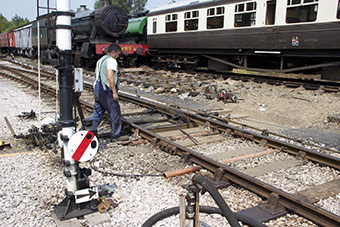 The Permanent Way gang has been working with the Signal & Telegraph Dept. 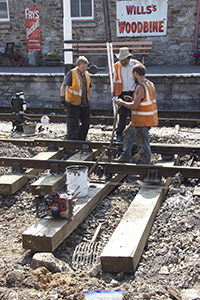 on the retimbering of the loop to loop spur points at Buckfastleigh. The two timbers at the toe of the point were life expired, and the gang had run out of time to replace them during the winter. Hopes that the timbers would last the operating season proved to be forlorn, and their poor condition was contributing to the difficulty of getting the signals to work reliably. 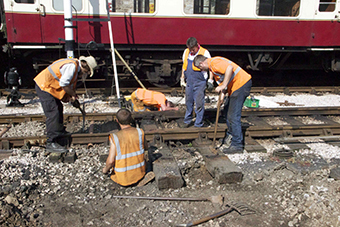 The photos show the gang working to disconnect the point rodding, signal wires, locking and detection before removing the old timbers, followed by replacement with new material (four timbers renewed in total), and the final proving and testing of the reinstated S&T elements. 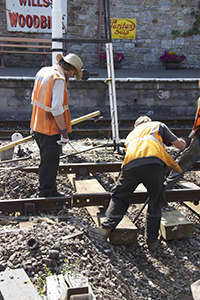 The job took just under two days - 17 and 18 July - and necessitated using three locomotives to work the two-train service on the Wednesday, as running round was not possible. They were 1369, L.92 and Class 37 6737.